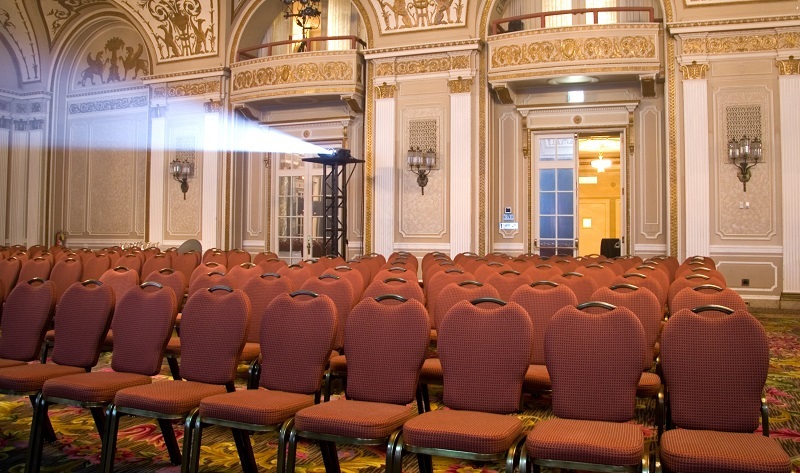 Projectors have long been a staple of the event industry. From seminars to conferences and product launches, projectors enable event planners to ensure that the audience is able to get the information they need and deliver visuals that are easily seen by every attendee. There are many different factors to consider when selecting which projector rental is right for your event and the wide range of products and features available can be confusing. Have no fear -our handy guide can help you select the right projector rental for your next event. The size of your space and audience is one of the most important factors in selecting the right projector for your event. Once you’ve selected the location of your event, measure the space and map out the setup you’ll use on the day of the event. Having this information in hand, you can start to narrow down your projector selection. Planning a huge presentation or product launch in a massive converted warehouse space? Then you’re in need of a large venue projector rental, with its 5,000 or more lumens designed for projecting oversized images for big audiences. Whether you’re staging a trade show or a concert, large venue projectors can help create the excitement your event demands. Don’t forget to equip your breakout spaces. If your next conference includes breakout sessions in smaller meeting rooms, our breakout room projection rentals allow your team to quickly and easily deliver information to participants. From slideshows and spreadsheets to short videos, these projectors help move along the discussion while giving your breakout session leaders the ability to disseminate information easily. Aspect ratio is the geometry of the projected image, or the ratio between the width and height of an image. For quick and easy reference, the aspect ratio of a projector is displayed on the equipment itself, with the most common ratios being 4:3 and 16:9. If your projection media includes video, the most important consideration for aspect ratio is the type of video you’re projecting. If your media is streaming or in widescreen, you’ll want to look for a widescreen projector that offers a 16:9 aspect ratio. When selecting projectors for PowerPoint presentations or video directly from a desktop or laptop, a 4:3 ratio is generally sufficient. While you can project media with a larger aspect ratio on a projector with a smaller aspect ratio, you will lose viewing quality as the projector shrinks or cuts off portions of the image. Image resolution is the number of pixels used to create an image. You’ll need to find the resolution of your video or other display content. If you’re projecting from a computer screen, you can use the computer’s resolution as a guide for selecting your projector. For streaming TV or video, the resolution is identified using only the number of horizontal pixels followed by the letter ‘i’, such as 720i or 1080i, while recorded content uses the letter ‘p’, as in 1080p. Want to know more about image resolution? Check out our sister site’s recent post Is 4MP the Same as 4K? : And Other Questions about Image Resolution You’ve Been Dying to Have Answered. For the best quality projection results, you should select a projector whose horizontal number is at least as high as that of the videos or images you want to view. Need to share high-resolution media? High definition projector rentals offer crisp and clear images at an impressive 1080p, important for events that include video, images, and presentation slides. In the lingo of projectors, brightness is the amount of light your eyes perceive from a projected image. Conversely, contrast is the difference between the brighter and darker portions of that image. Brightness is typically measured in lumens. The higher the number of lumens, the brighter the projection. Contrast is measured as a ratio of the brightest white and darkest black the projector is capable of producing. The greater the difference between the numbers in the ratio, the better the viewing experience. When thinking about the number of lumens and the amount of contrast you need from a projector rental, think about the lighting in your event space. If your projections take place in an entirely dark room, you may not need a high lumen projector. If you’ll have natural lighting coming into the space or have ambient lighting, you’ll need a brighter projector to help event attendees clearly view the media you’re sharing. Projector rentals are an ideal way to ensure that the information and images you want to share are seen by all attendees at your events. Making the right choice for your projector rentals can be the difference between muddled images and sending a clear message to your attendees. If you need guidance on the right projector for your next event, the experts at Rentourprojectors.com have a wide variety of projectors to meet the needs of your next event, conference, or project. Get a quote for all of your projector rental needs today! Need other event equipment rentals or event production services? Our sister company, Rentacomputer.com, offers comprehensive event technology rental solutions for any event big or small as well as event production services for almost any industry or event type. Get expert advice and a quote for all of your event rental needs today. Subscribe to our blog today to stay up-to-date with Rentourprojectors.com and follow us on social media. Join the discussion by commenting below.